Miami, FL – Pablo Lopez was left stranded as the Miami Marlins were unable to back him up, losing 4-0 to the Chicago Cubs Tuesday night. Lopez lasted five innings fanning six, giving up two earned runs and scattering five hits but the team failed to generate enough scoring opportunities. 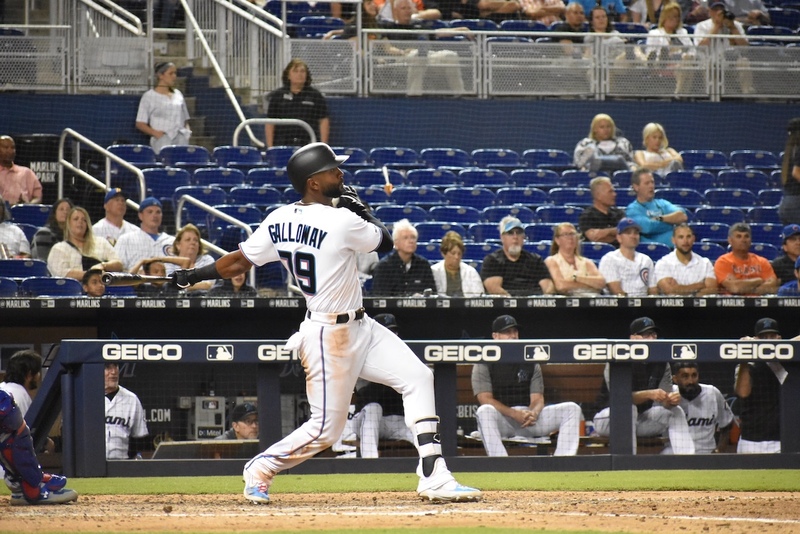 Prior to tonight’s game, there were three Marlins hitters of note who’ve been successful against left-handed pitchers: Lewis Brinson (.286/2 Doubles), Starlin Castro (.500/2 HR/ 4 RBIs) and Martin Prado (.467/2 Doubles/1 RBI). None of that mattered as the team’s bats were largely silent throughout the evening, starting with Cubs starter Jose Quintana. It wasn’t until the seventh inning that Miami had a runner at second base. Austin Dean doubled to left with two gone. Brinson struck out to end the inning. Isaac Galloway makes his season debut tonight. LETSGOO. The Cubs jumped to an early lead in the third after Daniel Descalso hit an RBI single to right, scoring David Bote. The following inning, the bases were juiced for Bote, who grounded softly to Rojas at shortstop, allowing Javier Baez to cross the plate. Chicago added another insurance run in the eighth after Baez homered to right center field, knocking one off Adam Conley. They tacked on one more in the last frame. In the home half of the inning, Miami had its best chance of the evening to tie the game. Jorge Alfaro was up at the plate with Brian Anderson at second and Castro at first. Alfaro went deep to center with two outs but came up just short, flying out to outfielder Albert Almora on the warning track. Besides up on the mound, the only other bright spot was our latest call-up. Earlier today JT Riddle was optioned to Triple-A New Orleans, making room for Isaac Galloway and Jarlin Garcia. Galloway impressed over at right field, making two terrific plays. In the fifth frame, Galloway caught a fly ball from Kris Bryant, throwing a cannon over to Anderson at third to nail Descalso who tagged up from second. Two innings later Galloway ran down a hard hit from Bryant, making an awesome catch towards the wall, robbing the Cubs of at least a run. Taking a closer look, the Marlins stranded 33 runners the last five games leading into tonight. They were 2-for-25 with Runners In Scoring Position. Even in their 10-3 win Saturday night, the team was 2-for-10 with RISP. On an individual basis, three guys stand out. Austin Dean is batting .667 with RISP in 3 At-Bats, tallying a double and four RBIs. Surprisingly, Martin Prado is hitting .800 in five ABs, marking up his own two-bagger with a pair of RBIs and a walk. The real clutch guy is Miguel Rojas, he is .400 in 10 AB with two doubles, six RBIs and two walks. The team overall bats .208 with RISP. Now, with two outs and RISP you once again have three standouts, only this time it’s Lewis Brinson and Rosell Herrera joining Rojas. In this stat category, Brinson is hitting .500 in two At-Bats, collecting an RBI. Herrera, meanwhile, is hitting .400 in five plate appearances, notching a double with two RBIs. Again, Rojas is the clutch man batting .500 in eight ABs. During that, he has a pair of doubles, five RBIs and two walks. Teamwise they’re hitting .180 with RISP and two outs. What about when the bases are loaded? The team hits a very ugly .071, need I say more? It’s preferable for the team to hit when it counts rather than have a bunch of base hits with little to show for. But then you’re faced with the realization that in many games it isn’t just a lack of clutch hitting, it’s a lack of hitting period. As Brad Pitt emphasized in the movie “Moneyball”, you can’t score if you can’t get on base.